Happy Sunday & Mother's Day to all the moms! I have pinned these looks from two of my favorite bloggers - Something Navy & For All Things Lovely to my Pinterest boards. 1. This linen jumpsuit would be a perfect summer outfit. 2. This off the shoulder floral maxi dress would be so pretty for a summer wedding. 3. These popular heeled sandals with an ankle strap are marked down 33% and under $60. They also come in a fun floral print. 4. These suede ankle strap sandals that come in 3 colors are under $50. 5. This pretty lace dress is 40% and only $33. 6. This is a cute plaid off the shoulder romper that is on sale for under $30. 7. I love to wear strappy camis in the summer - and this one is the best color. 8. This satin blouse is only $10 and comes in 3 colors. 9. This bell sleeve sweater is marked down to $15. 10. I think this tee and its saying are perfect - something we always need to be reminded of. I shared 10 more deals & picks yesterday, along with my top five most popular items on Friday. Be sure to link up your favorite posts (including fashion ones) this week with my friends at The Blended Blog. Love their style! I so wish I had those long skinny legs!! 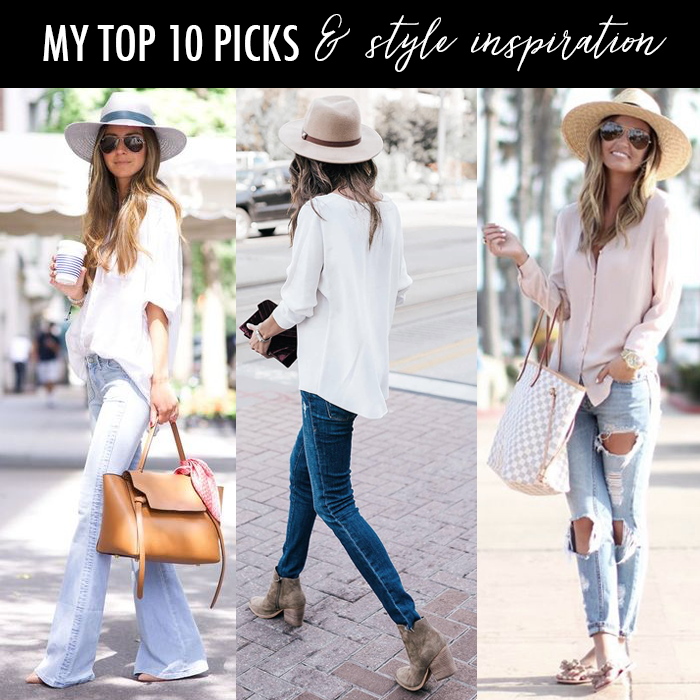 I live denim and a white (or light pink!) top! So simple yet so stylish.